What Sets ICS, “God-With-Us” School, Apart? community committed to personalized learning designed to develop the whole child. 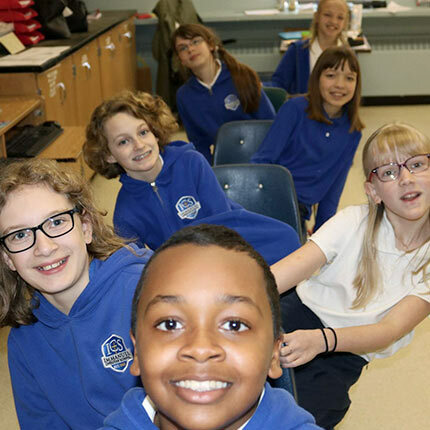 We offer the Durham Region a unique, engaging, well-rounded, and thoroughly Christian 21st-Century educational program that empowers students to take risks, develop character, and learn successfully. Our children are encouraged to make a difference to local and global communities as Christ’s ambassadors, and they thrive in doing so. This is an exciting venture for us, framed in our prayerfully-crafted strategic plan. * As we journey forward in excellence, may God’s purposes be achieved, and His glory be the result! How Does ICS Foster Student Engagement~Deep Learning? Improvement initiatives are being implemented in six areas of school. The goals outlined in the ICS Strategic Plan target school culture, academic excellence, support programs, facilities & technology, financial integrity & sustainability, and local/global community involvement. Students are equipped and encouraged to articulate their faith and join Christ in restoring His world. They learn to see themselves and others as Image-Bearers, God-Worshippers, Idolatry-Discerners, Justice-Seekers, Servant-Workers, Community-Builders, Order-Discovers, Creation- Enjoyers, Earth-Keepers, and Beauty-Creators. Foster 21st- Century Skills and Literacies Collaboration, critical thinking, creativity & communication skills are developed and meaningfully measured through inquiry-based learning processes, products & presentations. Imagination is fostered, and multicultural, economic, environmental, and technological literacies are strengthened. It is important to note that standards set by the Ontario Ministry of Education are consistently met and surpassed at Immanuel. Cross-country, soccer, volleyball, basketball, track & field, ski club, flag football with the Argos’ Christian pro-football players, outdoor education & extreme wilderness hiking events, school-in-the-mall, robotics, and various competitions, performances, tours, and on-site music lessons augment our curriculum. We secure a variety of educational therapies and support services available through the National Institute of Learning Development, the Community Care Access Centre (CCAC), and the Department of Development and Social ervice at Durham College. A children’s grief and loss program, on-site tutoring, ESL, and our parent/grand-friend volunteer programs provide additional student support.